Have you heard of Millionaire’s Bacon? Basically it’s candied bacon that’s been coated in sugar and spices and it turns out to be the most decadent treat imaginable. 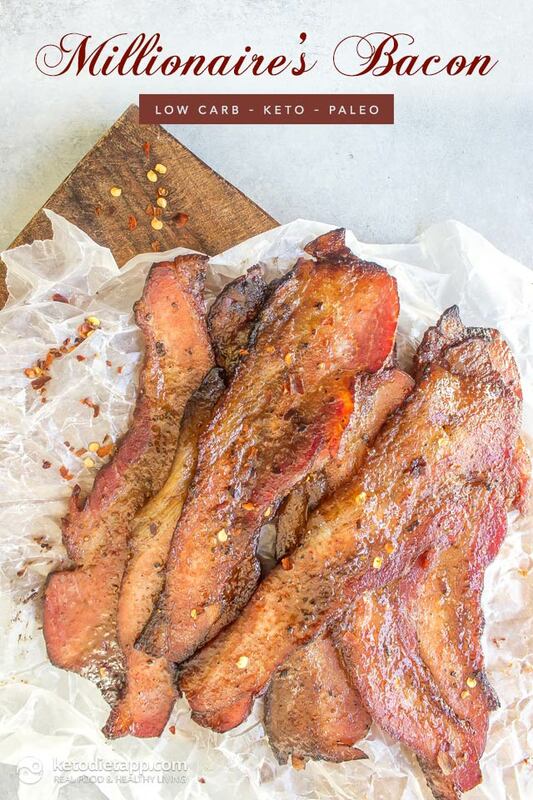 This low-carb version, or Keto Millionaire&apos;s Bacon if you will, is sugar free but just as delicious. 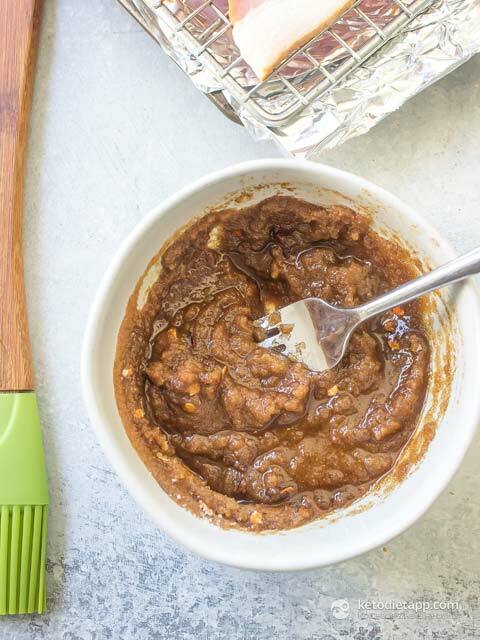 It makes a great protein and fat filled snack that still satisfies your sweet tooth. Note: Tamari is gluten-free soy sauce made from fermented soy (always double-check it&apos;s gluten-free). Just like natto and tempeh, it&apos;s a type of soy products that can be used in moderation. Preheat the oven to 200 °C/ 400 °F and place a rack over a aluminum foil lined baking sheet. 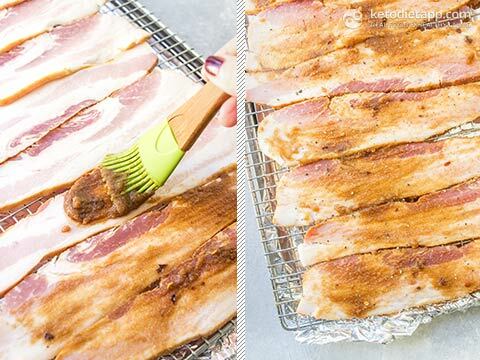 Place the bacon in a single layer on the rack. Note from Martina: I prefer to use a lower temperature setting and bake it at 135 °C/ 275 °F for 60-75 minutes. This way you will avoid burning it. Whisk together the tamari with the spices then pour the mix into the Swerve and mix together. Brush the mixture over both sides of the bacon then roast for 40-45 minutes until crispy. Allow to cool before serving. 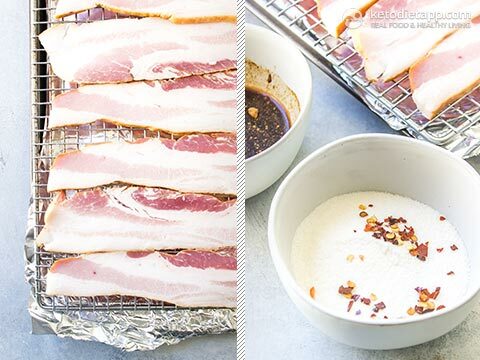 Store the bacon in an airtight container in the refrigerator for up to 5 days. Reheat by placing it under the broiler for 3-4 minutes. Burned black at 40 minutes. 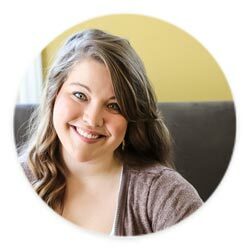 I had a 12-oz package of bacon instead of 1 lb.--would it make that much of a difference? Hi Terri, I think the 200 C may have been in a conventional oven (that would be 180 C in fan assisted). I bake mine at 275 F (135 C) for 60-75 minutes - similar recipe is here: Chocolate Dipped Candied Bacon. (I'll add a note) I hope this helps! Thanks! Going to try again right now! It was a hit! I think part of the problem the first time was that even though the first package was labeled "thick cut," it wasn't cut nearly as thick as the second package I bought. Same number of slices in both packages even though the first was 12 oz. and the second was 16 oz.! So there's a caution for people: make sure it really IS thick cut bacon. Good point! Thank you Terri! I had to check this one out, just because of the title. Millionaire's bacon is an entirely new concept for me and seems odd at first glance. Spices, sure. Sugar? Forgive me, I don't see the appeal. That being said, your version sounds good and would be an interesting flavor variation compared to just plain bacon. Hi, Vince! 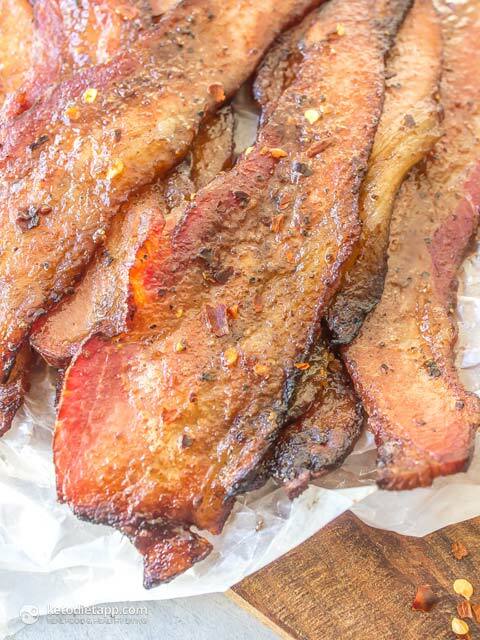 Millionaire's Bacon is definitely for those who enjoy the Sweet/Salty combo that's taken the world by storm in recent years. I make maple glazed bacon and dark chocolate dipped bacon almost constantly, but I'm absolutely a lover of all things sweet/salty combined. Please do give this recipe a chance--you never know, you may become a sweet/salty fan too if you do! All the best for a fantastic 2018!! How would Pork Belly work with this recipe? Maybe for the BBQ ? Please advise.